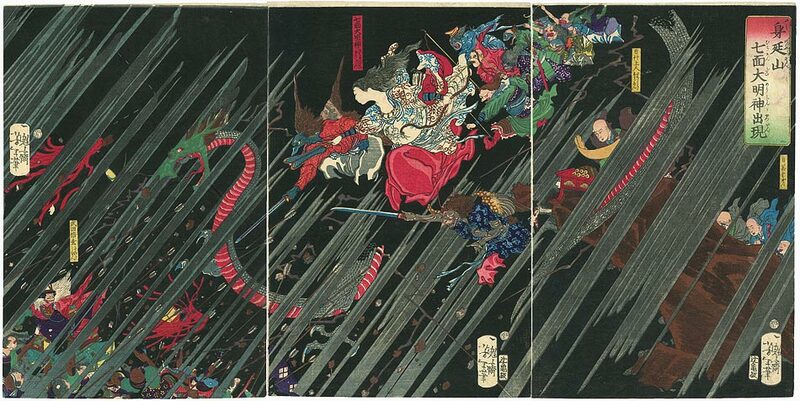 also named Taiso Yoshitoshi 大蘇 芳年), a Japanese artist. 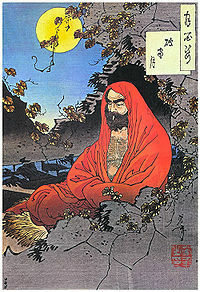 He is widely recognized as the last great master of Ukiyo-e, a type of Japanese woodblock printing. He is additionally regarded as one of the form's greatest innovators. His career spanned two eras – the last years of feudal Japan, and the first years of modern Japan following the Meiji Restoration. Like many Japanese, Yoshitoshi was interested in new things from the rest of the world, but over time he became increasingly concerned with the loss of many aspects of traditional Japanese culture, among them traditional woodblock printing. 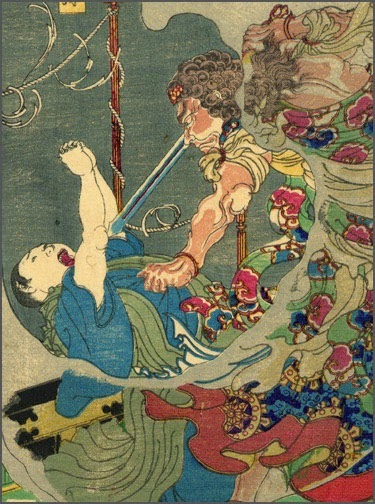 Kiyomori had become the most important man of Japan by ruthlessness. He suffers from insanity in the winter of 1180, watches the skulls of his victims in agony and will perish soon. The last of these hundred prints shows Matsuo Basho!
. Gabi Greve, November 2006 .
. WKD : Moon and Haiku .
. WKD : Murasaki and Haiku . 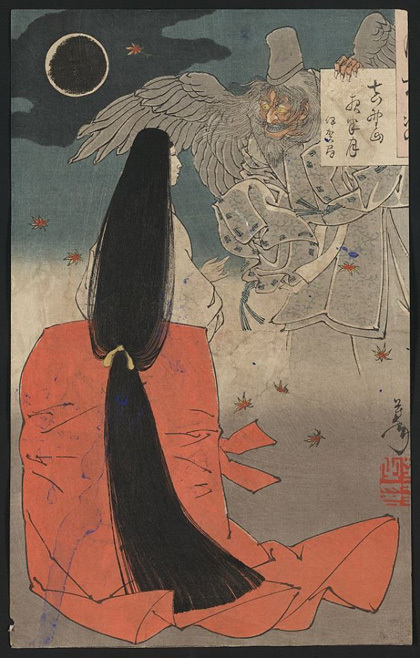 A Tengu with claws is showing a letter to a lady who has very long hair hanging down her back . . .
CLICK for more Yoshitoshi photos ! His style was distinctive and so were his subjects - Noh plays. Kogyo was born under the real name of Hanyu Sadanosuke in Tokyo. 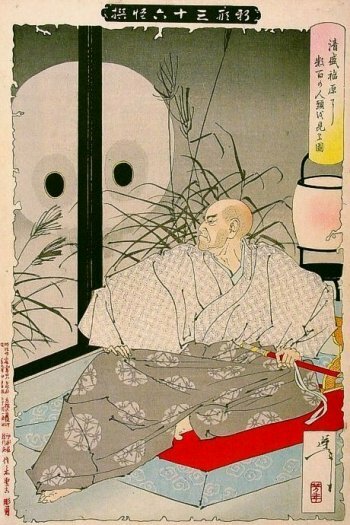 When the young boy was fifteen years old, his mother married Tsukioka Yoshitoshi, the famous ukiyo printmaker. From his stepfather he received his new family name Tsukioka and his first lessons in Japanese printmaking. Later the young man became the student of another well-known print artist of the Meiji period, Ogata Gekko. Following an old Japanese tradition, he received a new first name from his teacher - Kogyo. The name game was finished and a new artist was born - Kogyo Tsukioka. yama no inu, yama-inu, yamainu 山犬 "mountain dog", wolf .
. 月岡芳年 Tsukioka Yoshitoshi .